Sweet Pepper Sauce is truly a delicious pepper sauce, a crowd favoritethat leaves you longing for more, in spite of the heat. 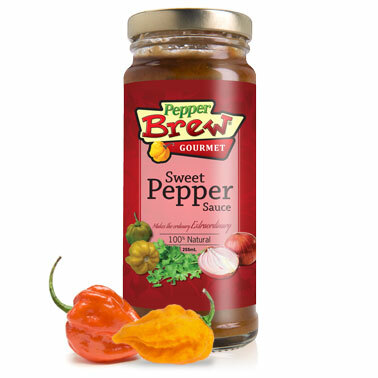 Sweet Pepper Sauce is a crafted blend of fine herbs such as fresh cilantro, ginger and other spices blended with fruit, olive oil and habanero peppers & scotch bonnet peppers, the celebrities of the recipe. Slightly sweet, packed with a lot of flavor and a lot of heat; this sauce is a treat in barbeques, as a glaze over meat or fish, in dips such as salsas, on any sandwichor as acondiment with any meal.